Heavy work that can help everyone! "Heavy work refers to tasks that involve heavy resistance for the muscles and joints. It involves proprioceptive input, the awareness of posture, movement, and resistance relating to the body." How can Heavy work help? When working with children with sensory processing concerns heavy work is the 'go to' type of input- especially for home programs. Why? Because heavy work is always regulating and organizing to the nervous system, and you can't go wrong. Heavy work helps modulate the nervous system so that it can accept a variety of input. During occupational therapy sessions I use heavy work to help children calm down, after vestibular activities to help with modulation, and as a "warm-up" when working with a defensive child. The other day a parent came in and her child was less regulated than usual. Mom suspected it was because her grandparents were at her house for a few days, and many responsibilities were taken away from the child. Mom didn't need the child to vacuum, take out the trash, carry her baby brother, or clear the table-- because there were extra hands in the house. At the time, her mom did not realize that her daughter needed to do the work just as much as she needed the help. Sometimes home programs are overwhelming because parents feel like they are always having to come up with activities for the child to do to stay regulated. 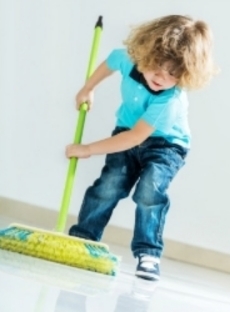 Building some tasks into daily routines will help keep your child regulated, teach your child functional skills and responsibilities, and take some of the load off the parents. Here is a video of kids in Japan cleaning their classrooms- and having FUN! These are all great heavy work ideas for home or school! When you make a sensory diet part of your everyday routines it can be helpful for the whole family !